GBBF is styled as the “biggest pub in the world” and offers around 450 beers from British breweries, as well as around 200 foreign beers from countries including Belgium, Germany and the USA. Traditional British cider and perry is also available. The festival is completely staffed by unpaid volunteers, around 1000 of whom work at the festival. Organisers are hoping for a bumper event as ticket sales this year are up by 32% on last year. Which means that the attendance will be well over the 64,000 thirsty people that turned up in 2009. At Waitrose, sales of bottled ciders and ales have risen 30% year on year as customers are trying out new producers. We have a fantastically rich heritage of cider makers and people seem to want to reach out and try local and national ciders. View all the listed ciders and perries available at this years GBBF. What looks like a delicious event begins on Friday the 9th of July. The first Cider festival is being held at the Ship and Castle, Congresbury, North Somerset, – they are hoping to run them every year if its a success! There is no admission fee, the entertainment is totally free and there will be at least 15 ciders from the area throughout the 10 days. We are hoping people will come ready for an afternoon of fun, food and cider. Why not bring a blanket or deckchair, chill out and listen to the music and drink loads of local cider! Although there is lots of decking furniture and benches. 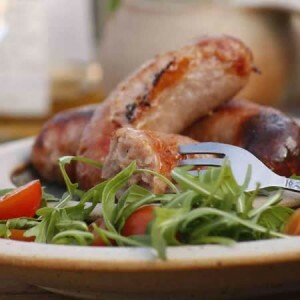 The BBQ will be a selection of the top 20 local sausages that can be purchased on a skewer with bread and sauces. There is also a full Sunday lunch on offer too from £9 per roast! Then on the 18th July – the Mangled Wurzles for the afternoon. The pub has a huge garden and a raised decking – perfect for totally chilled afternoons in the summer sun!